I bought myself a birthday present in early December. 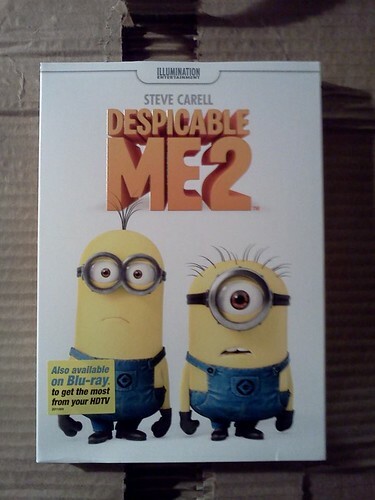 I enjoyed Despicable Me and really wanted to see DM2 in the theatre, but never got there. All the good words I read and heard from others who saw this as well as the thoroughly silly promos done for the movie told me I would enjoy this as much as I like the original. Truthfully, I have laughed and chortled and giggled and guffawed through this movie. I watched it again last night and turned on the director's comments. I have to watch it again because they pointed out the action going on in the background of some scenes. They gave a great deal of thought to what one could see behind the main action and, after pointing that out, there is quite a bit of hilarity behind Gru and Lucy or the girls. Computer animation being what it is now, the depth of vision in animated movies is huge. So much can be added from textures to creatures that it's going to take me awhile to see everything. I didn't know the rocket ships at the end have city names painted on them and one of those names is Hoboken, New Jersey because director Chris Renaud lived there for awhile. Now, I have to pause the movie at that point and read the rocket ship names. When I got the movie in the mail, I had to watch everything, all the trailers for upcoming films (a Barbie film? Seriously? It's awful.) and then there was this flashed on the screen. Whoa. Sadly, it's to advertise their iPhone, iPad and Android phone free games. I wouldn't use my phone to play games. The screen is too small. Maybe if I had an iPhone but this is not a reason to get one. 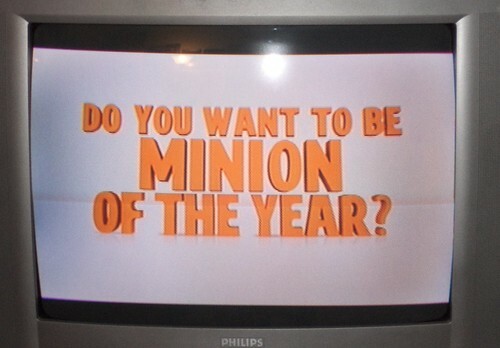 Then, there came an advertisement for the "ultimate" in minion experience. Universal Studios has teamed up with the creators of Despicable Me to create a 3D ride opening, according to the DvD, in spring of 2014. But, if you go to the ride at Universal Studios Florida, it sort of seems as if it's open now. Oh dear me. I've never been to Universal Studios in Florida. I've been to Walt Disney World several times, but there was never enough time to take in both. Looking at the map of Universal, it's probably a 3 day adventure for me as I wouldn't be able to handle all the walking and standing in a couple days. Some things, as with Disney World, I'm not that interested in, but Minion Mayhem? Wow. This is a long-term goal. The first year we went to Disney World, we made a chart, one of those thermometer-type charts, that showed how we were saving for the experience. I could do the same thing. A visual graphic makes the event seem much more real when the saving has to be done over a long period of time. I'd get an all-inclusive package with airfare. I have a friend in Orlando, but I would never presuppose to have her put me up. That's way too cheeky, so I'd look into hotels too. I did a very good job of figuring out costs to go to Virginia last year. I could do this. It's at least a year out because there are other things that have to be fixed before I can look at dedicating funds toward a trip like this...unless...you're going soon. Can I go in your luggage?